The UK has one of the best road safety records in the world. 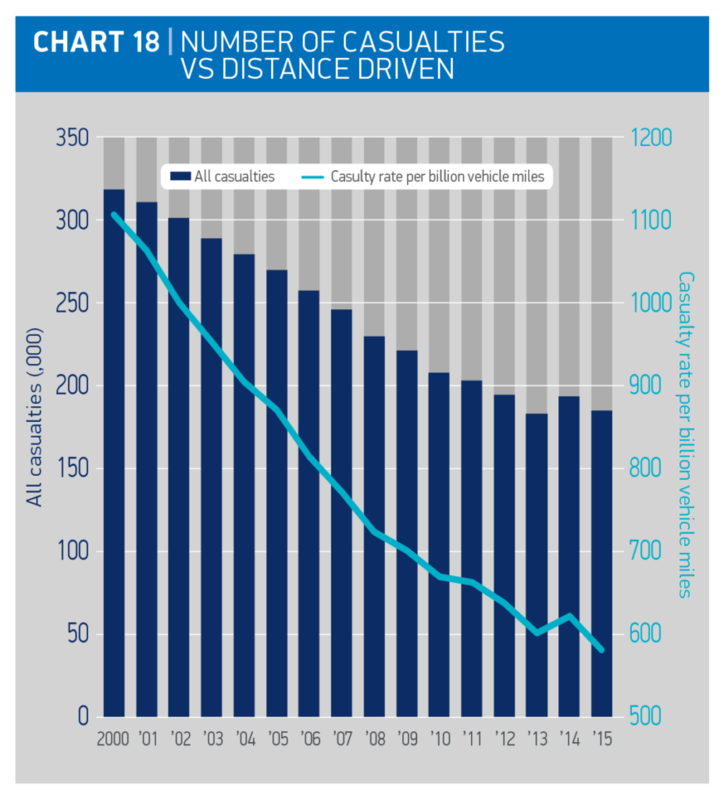 The motor industry has a long-standing tradition of innovation to improve vehicle safety features, which plays a key part in ever improving road statistics. An increasing number of vehicles are being sold with autonomous safety technology such as autonomous emergency breaking or collision warning systems installed as standard or available as an option. Further future implementation of CAVs onto UK roads is expected to bring additional safety advances. However, in the anticipated lengthy transitional period, there will be a mixed fleet of CAVs and manually driven vehicles and managing their interaction will be critical. The Organisation of Economic Cooperation and Development (OECD) has established a strong link between accidents/casualties and increasing economic development, because greater traffic volumes result in more incidents. This continues until a critical threshold in economic development is reached. At that point, better training, vehicle standards, enforcement and design, and road engineering counteract the effects of traffic increase. The automotive industry has been actively contributing to increased road safety by adopting more innovative vehicle designs and introducing advanced safety technology such as autonomous emergency braking or collision warning systems installed as standard or available as an option. In 2016, there were a total of 181,300 road casualties on UK roads – the lowest level on record. This is 43% and 3% lower than 2000 and 2015 levels respectively, and was achieved despite a 2% increase in distance driven in 2016. This represented 560 casualties per mile driven, which represents a 4.4% drop on the previous year.